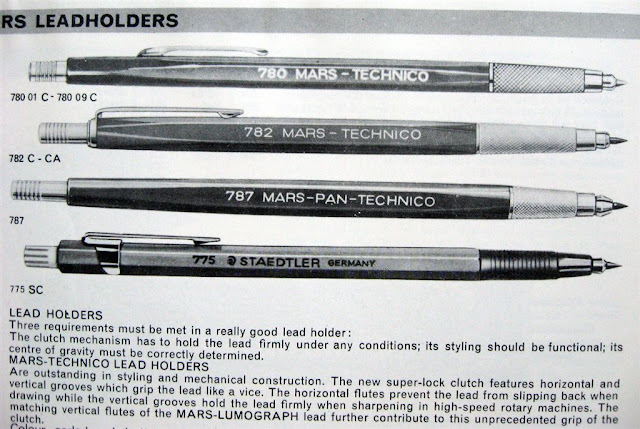 Just as a follow up to my recent posting on the 1969 Staedtler catalogue and the Space Race, here's an article from Flown Space Collectibles on the writing instruments that the astronauts of the Mercury, Gemini and Apollo missions actually used in space. Thanks to Henrik for sending me the link. Here’s a bit of an unusual beast from the Paper Mate stable. I say unusual because it sort of looks like a MechFranken pencil to me. The head of one pencil cut off and stuck on the body of another. I’m not saying it’s necessarily ugly, just a bit unusual and disconcerting. I quite like the crimson red ring grooves in the grip zone and the red pocket clip moulding is quite eye-catching, but the transition from the straight thin main shaft to that large bulging silver top housing…like I say, it looks like the surgeons have been experimenting to me. I’m not sure about the colour scheme either. The main body is matt and has a brownish tinge to it that I don’t think quite goes with the metallic silver top section. And what exactly is that top section for? 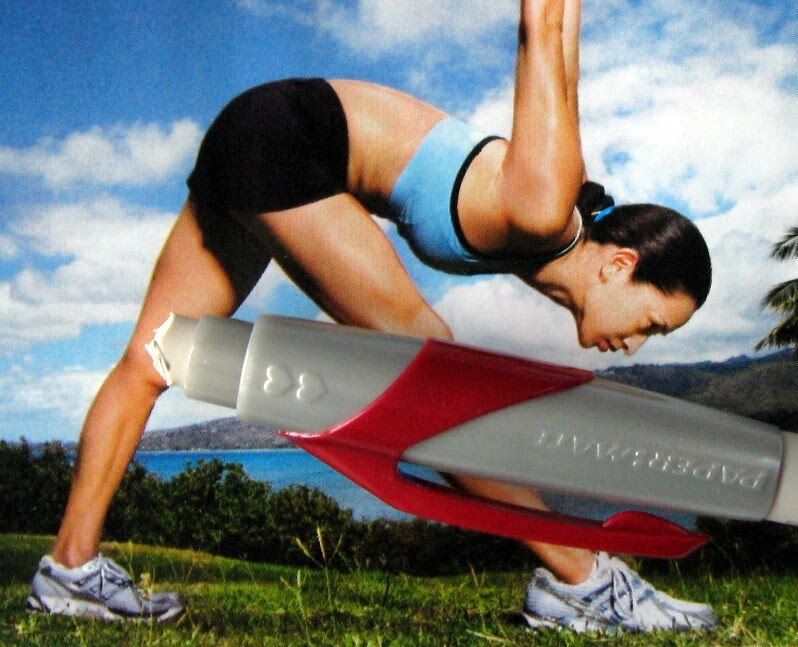 It looks like it should be housing something, like an extendable eraser, but it isn’t. It is apparently purely decorative. It serves no functional purpose. Just like decorative pillows…ahhh, I’m getting started…moving on now. Perhaps one of the other colour combinations available for the FlexGrip would suit me better - the black with silver trims for example! In the hand the Papermate Flexgrip Elite feels quite good. The grip is on the narrow side, but I like the feel of the grooved rings under-finger. The main body has one of those rubberised coatings which even though they are rubber I can accept. They don’t feel that rubbery, don’t look rubbery, aren’t squishy and do actually improve the grip characteristics, particularly for long term use like in a lecture or exam. Having said that, there are sometimes issues with the long term durability of these rubberised coatings…but it’s not an expensive pencil. Also despite the large top section the pencil is still lightweight and neutrally balanced. I did note an annoying tendency for the FlexGrip to sometimes squeak when writing. I think this noise came from the lead cushioning mechanism. Also, for the heavy handed, the FlexGrip lives up to its name and you can feel some flex in the body when writing. The lead sleeve is a retractable cone as you might expect on a general writing mechanical pencil like this one. When retracted the front section is fairly blunt so the pencil is pocket safe. Again as expected the mechanism is a standard push top ratchet, with the uncovered eraser being the push button. Ten clicks of the quiet and smooth mechanism will get you about 7mm of the 0.5mm lead. The uncovered eraser works reasonably well as an eraser but obviously won’t last that long if used frequently. Because the eraser is the push button for the lead advance mechanism you will probably inadvertently advance the lead when you use the eraser. Now there’s nothing particularly unusual about that, but for some reason I found this more of a problem than usual with the Paper Mate Flexgrip. Also of course being uncovered and out on display, when the eraser has been used and worn down, it does detract from the looks of the pencil. I don’t really think that fits with the Elite association. You can pull either the eraser or the whole housing out of the top section to access the lead refill magazine. It is only a narrow plastic tube so you won’t get a whole heap of lead down there. The eraser housing is a push fit onto the plastic lead magazine tube. The pocket clip is moulded plastic and quite strong, but like many such clips it does not actually touch the body so won’t securely clip onto something thin like just a couple of sheets of paper, but on something thicker though it is fine. There are some Papermate graphics and model details printed on the body of the pencil, but these quickly wear off in use. See what a difference two weeks of use makes? 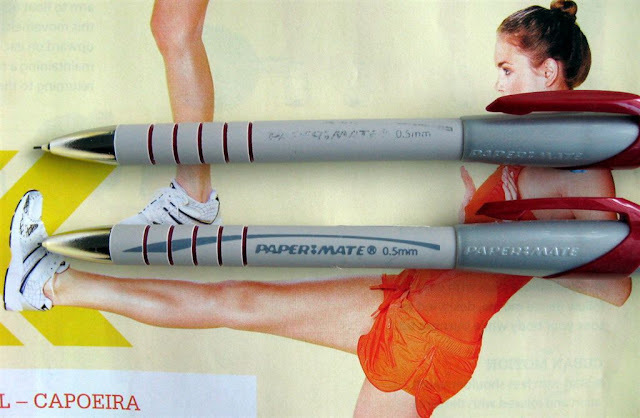 ‘Papermate’, the Papermate double heart logo and ‘Korea’ are moulded into the top section. Overall then, this mechanical pencil is a bit of a mixed bag, but it doesn’t exactly cost the earth! • Best Points – The rubberised body. • Not So Good Points – I don’t think the whole overall look really gels together. Dimensions – Length 148mm, diameter 9mm at grip zone. Balance point about 70mm up from the tip. This Papermate FlexGrip Elite mechanical pencil was supplied by Euroffice, an office supplies specialist in the UK, in exchange for a review of the pencil and an acknowledgement. 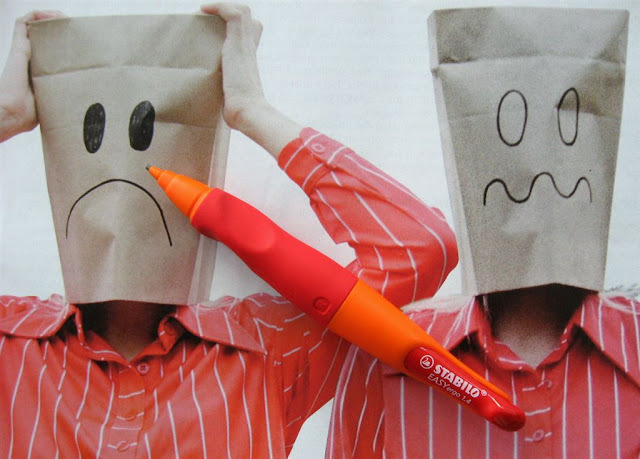 Back in April 2009 I reviewed the Stabilo ‘s move easyergo mechanical pencil. Whilst I was reasonably impressed with the pencil, I certainly was not impressed with that monstrosity of a name. Well, it seems that Stabilo have had a bit of a rethink and the ‘s move bit has gone, turning an abomination into something far more palatable. Hoo-rah for that, good on you Stabilo. It’s been out for a while, but now there is a 1.4mm lead version to compliment the original 3.15mm version. Advertised as suitable for ages 7+ I think this 1.4mm pencil is an excellent addition to the range. I was never totally convinced about the use of 3.15mm lead in the original version and feel that 1.4mm is a good choice – strong enough to handle the demands of learner writers yet fine enough to not require sharpening. As pictured here, you unscrew the top half of the body to access the lead magazine. See what a difference a simple name change can make to the general happines of the world! Like the original version there is an absolute minimum of separable parts in this mechanical pencil, an important consideration when dealing with young investigative but easily distracted minds. I noted that the packaging did not state any country of origin. Informed sources have since advised me that apparently EU rules only allow a country of origin statement when it is in all (17?) official languages and clearly Stabilo only use a subset of the official languages. As to it’s actual country of origin, well, like many manufactured goods that’s a complicated little game. Apparently the two-shot grip zone piece is made by Stabilo in Germany, and the remaining parts (except for the mechanism) are made by Stabilo in the Czech Republic. The lead mechanism is purchased from Japan, the leads from Korea, and the final assembly and packaging are done by Stabilo in the Czech Republic. I will leave you to decide country of origin. 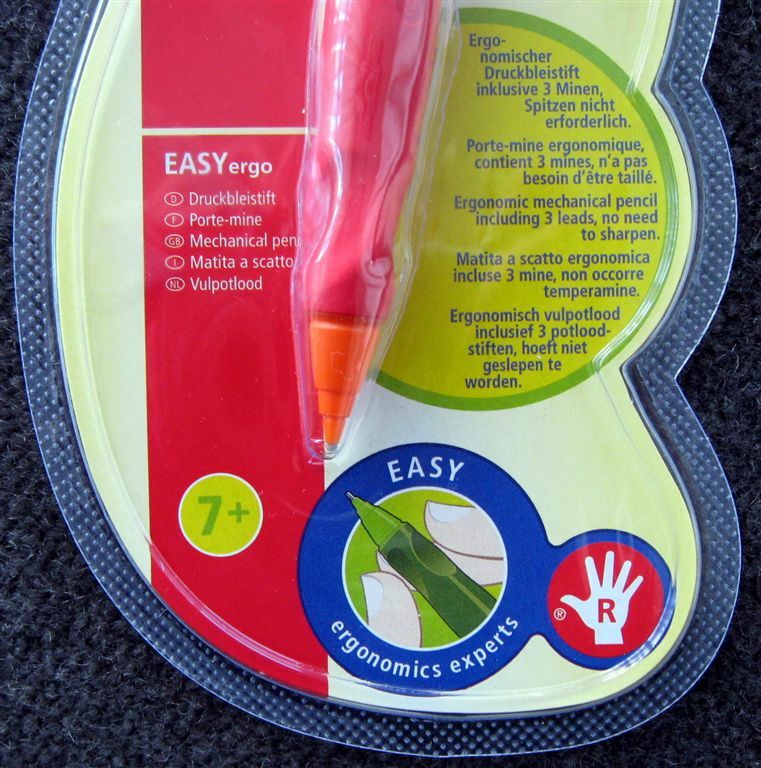 Anyway, if you are in the market for a pencil for younger folk, then I suggest you check out the Stabilo EASYergo range. This EASYergo 1.4mm mechanical pencil was given to me by Cult Pens. Well readers, today we have a guest review, sent in by Jarmo from Finland. I’m one of those people, who love not only pencils (and some pens too), but also various gadgets or anything with a useful or at least semi-practical “trick” to it. 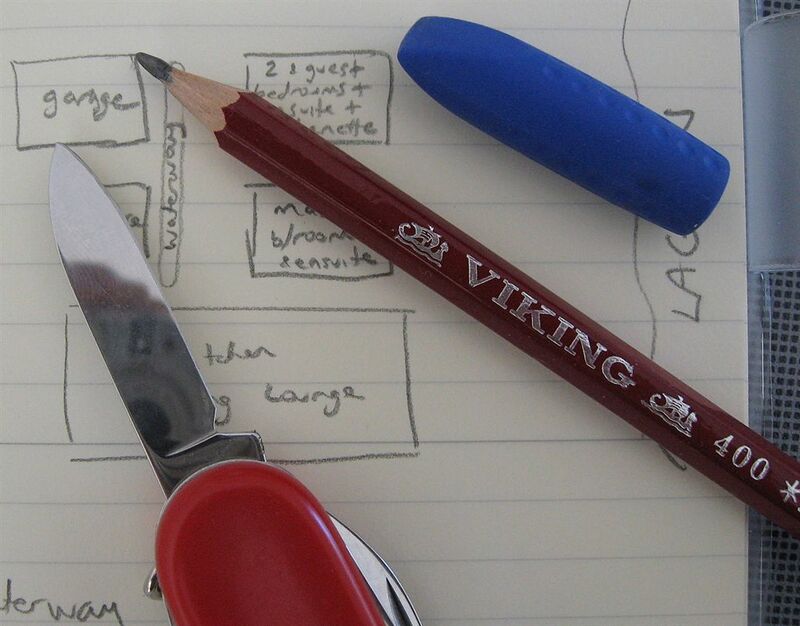 So when I found out multipens exist, they seemed right up my alley: the Swiss Army Knife of pens, neat! Besides, I need both pencil and pen at work, which made the combination seem all the more attractive. So I bought a few of them. My favourite ones by far are Zebra Sharbo X and the similar Tombow Zoom 414, but I like the Sharbo X a little better, so that’s the one I’m reviewing here. The Sharbo X is available in many materials, finishes and colors. The ones you see here are Zebra Sharbo X LT3 in matte grey and matte green. They are cheaper than most of the other options and I figured the matte finish would provide a better grip. 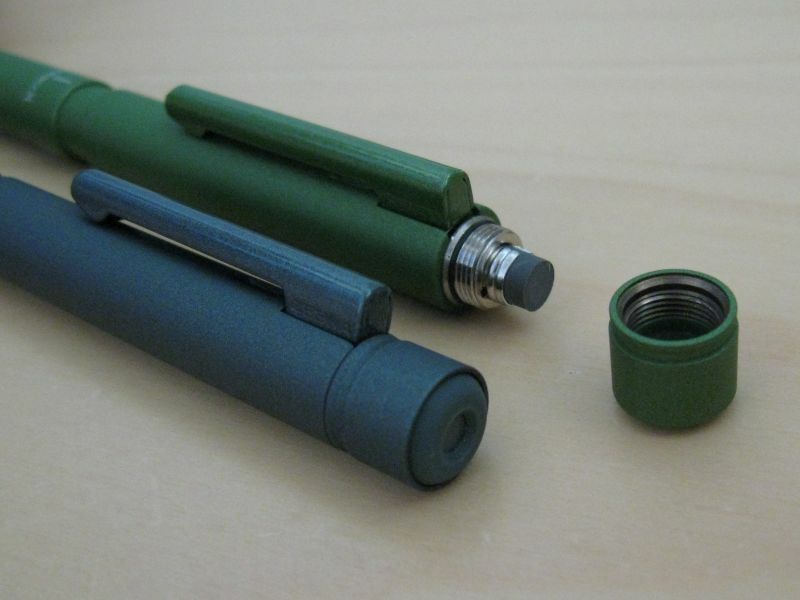 These pen bodies are made of brass, but there are aluminium and even carbon fiber models available as well. The innards are almost completely customizable. In addition to the pen body, you will need to buy at least three refill components. One of them must be a mechanical pencil, the other two you can fill with any D1-pattern refills. The mechanical pencil components are available in 0.3, 0.5 and 0.7 mm. They only fit one pencil component at a time. The pen itself is 134 mm long (writing tips retracted, add 3-4 mm when extended), about 9.4 mm in diameter and weighs 23 grams with the internal components installed. I think it’s a fairly compact pen. See pic below with good old Pentel P205 for size comparison. The body is fairly smooth with almost uniform diameter, and the only external features are a few markings, grooves and a pocket clip. There’s no rubberized or knurled grip section. The pocket clip appears to be steel and feels like it’s spring-loaded, but I haven’t disassembled to check. It has a fairly strong grip. Under the tailcap is a replaceable eraser, but the tailcap must be unscrewed to access it, so you’ll probably want to use a separate eraser. Still, it’s there if you need it. About midway on the body are three marks: I, II and III with the Sharbo X logo under the I. The number that the pocket clip points to marks the function that is currently selected. I is where the obligatory mechanical pencil component is, II and III are the other components. That’s right, the pencil is always number I. The different writing components are selected by simply turning the barrel in either direction, so whichever mode you have selected, the other two are always just a single quick twist away. There’s a definite tactile feedback when a given writing tip is extended and clicks into place. The selector can also be left in any in-between position, in which case the writing tips are retracted, making the pen pocket safe. Naturally, the barrel can still be unscrewed so you can change the internal components. Simply pull out the one you want to replace and push another one in its place. You can also change the refills without disassembling the pen, but you may need pliers to get the old one out. The pencil part won’t fit through the opening, however, so if you want to change that, you’ll have to disassemble. The lead is advanced by clicking the top of the pen, but instead of a button, the whole top half of the pen moves on each click. It works smoothly, but still requires a slightly stronger thumb action than most other mechanical pencils. With 10 clicks, the 0.3 mm component gives you 3.5 mm of lead, whereas the 0.5 mm one gives you 5.5 mm. 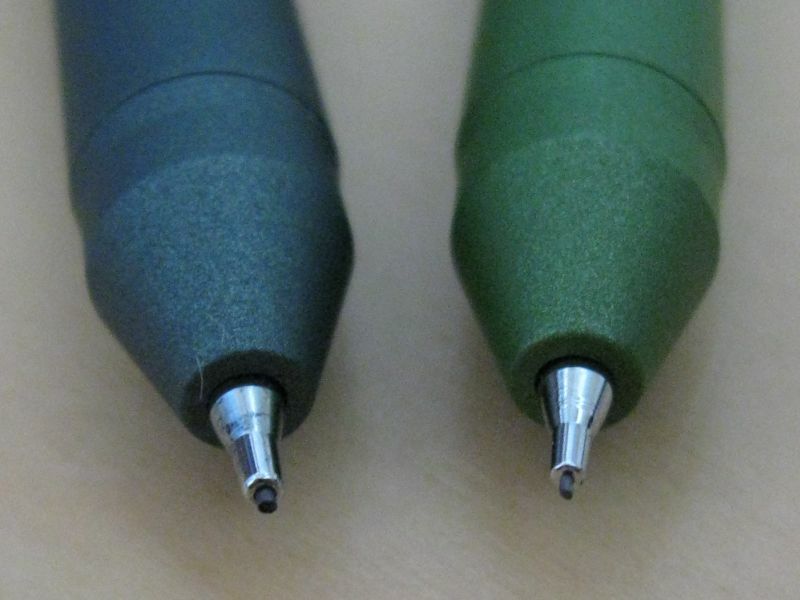 In the pic below, the grey pen has a 0.5 mm tip and the green pen has a 0.3 mm tip. One disadvantage of multipens is that the mechanical pencil part is tiny and will not hold many spare leads. I haven’t tried stuffing them to see how many they can take before jamming. I usually keep 3 spare leads in the 0.5 mm one and 4 in the 0.3 mm one. To refill the lead magazine, you can push the tail section to release the lead holding mechanism and feed in one lead at a time through the tip. Of course, you can also disassemble the pen if you want to put in several leads at once. The lead sleeve is only 2 mm long, so this is not a drafting pencil by any means. Due to the nature of the beast, the writing components also have a tiny amount of wobble to them, but not so much that it would bother me. Indeed, I didn’t even notice until I deliberately checked for it. Ergonomically, the pen is good, though it could be better. While the grip isn’t bad by any means, it’s not as good as knurling once your hands get sweaty from a lot of writing. On the other hand, unlike some pens with a built-in grip area, you can grip the Sharbo fairly close to the writing tip, which I like. When you pick it up, it seems surprisingly heavy for its compact size. The point of balance is located just a little beyond the halfway mark, about 70-71 mm from the tip. Technically, it’s slightly tip-heavy, but not enough to feel that way in practice. In other words, it feels neutrally balanced. As far as durability goes, it’s perhaps too early to say much, since I’ve had them less than a year. But I’ve used them daily at work, and so far, I’ve had no issues with either one. I have dropped them a few times, and once the green one landed on a concrete floor, right on the tip of the 0.3 mm pencil component. The lead shattered, of course, but the pencil component itself shows no signs of abuse and works fine. And even if it had broken, it would have been very easy to simply replace the pencil component with a new one. Since this is a pencil blog, I’ll only briefly touch on the other refills. There are many, many types and colors available from different manufacturers. Ballpoints, gel ink, highlighters etc. Tombow even has a pressurized Space Pen type refill, if you need to write upside down or underwater. I’ve found Zebra’s ballpoints to be very good, they start easily, write without skipping and seem to last a long time considering their tiny size. Their gel refills, on the other hand, seem to dry up and/or become scratchy fairly quickly. Also, it has turned out that D1-pattern refills are not quite universal. Tombow and Zebra ones seem to be interchangeable, but I tried a Lamy refill and it was slightly smaller in diameter, so it didn’t fit properly. Overall, I really like the Sharbo X, but I did make the effort to write as impartial a review as I could (and yes, I paid for both of them and all the refills with my own money). As I mentioned, I frequently need both a pencil and a pen at work, and these multipens work quite well in both roles. Switching back and forth between the modes is effortless. While there are some mechanical pencils that are better pencils that the Sharbo X, it’s still a perfectly satisfactory pencil. If you are looking for a multipen to add to your pen collection, Sharbo X and the Tombow 414 are the best ones I’ve tried. 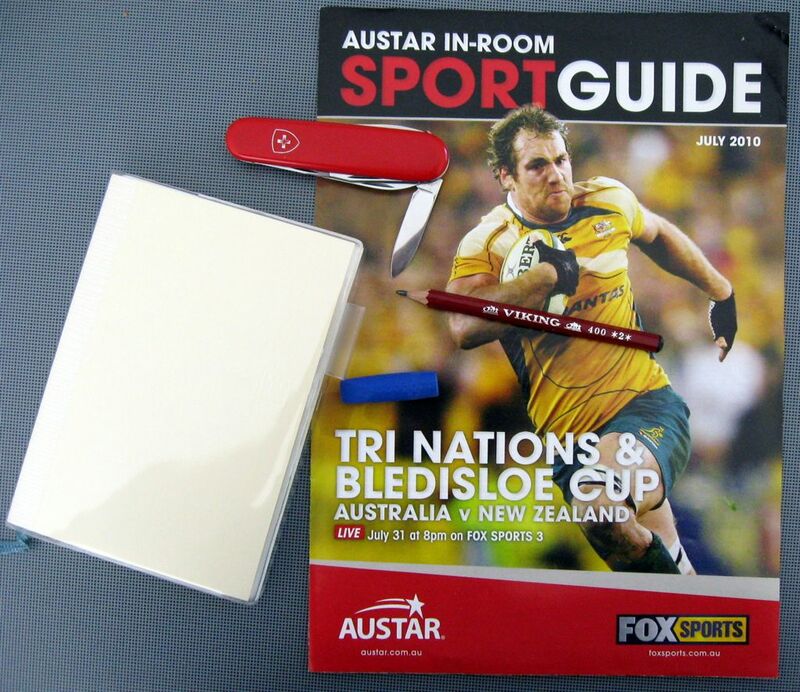 Good points – easily customizable, three writing functions, excellent selector mechanism, high quality, pocket safe. Bad points – grip could be better. Other points – lot’s of material, finish and color options to choose from before you even get to the refills. Price range – high, if you include both the body and the internal components. Dimensions - 134 mm long, diameter ca. 9.4 mm, balance point about 71 mm from the tip end of the body (with writing components installed but tips retracted). 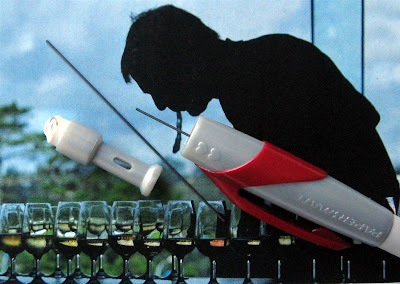 Sanfords announcement of a new product, the Sharpie Liquid Pencil has generated a bit of interest around the traps and quite a few folk have kindly contacted me to alert me to it etc. I'm rather skeptical of the whole concept, but here's a link to a very thorough review by Office Supply Geek. Nixon became President, Eisenhower died, Led Zeppelin I was released, the Beatles gave their last public performance, Sesame Street and Monty Pythons Flying Circus debuted, De Gaulle resigned, the Manson Family did their stuff. The Boeing 747 had its maiden flight, the Concorde had its first test flight and the Hawker Harrier jump jet entered service with the RAF. The USA got its first ATM machine, and the first messages and connections were made on ARPANET…the INTERNET was coming. But the real news was elsewhere - the Space Race was on. And by on, I mean really ON! The Soviets flung Venera 5 towards Venus and their cosmonauts undertook the first space transfer spacewalking from Soyuz 5 to Soyuz 4. Kiwi fired Mariner 6 and 7 at Mars, and not to be outdone the Americans launched Apollo 9, 10, 11, and 12. Neil Armstrong, Buzz Aldrin, Pete Conrad and Alan Bean walked on the Moon, and lived to tell. Against that backdrop of supersonic aircraft and space exploration, the pinnacle of human technological endeavour, here’s the 1969 Staedtler Mars catalogue. 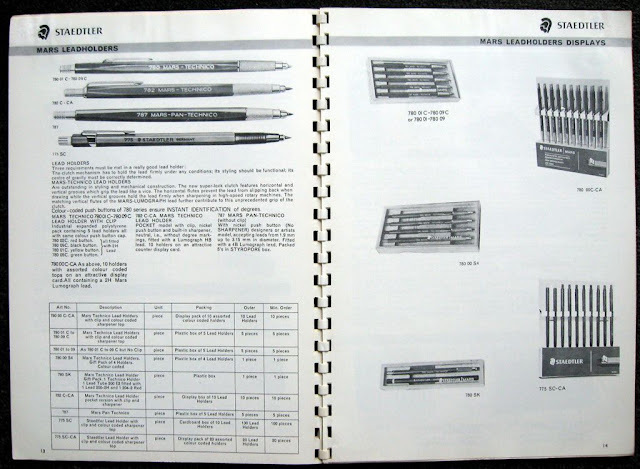 This is their technical drawing catalogue – wooden and mechanical pencils, technical pens, erasers, slide rules, drawing templates, compasses, etc. This is the stuff that space-rocket designers used. The catalogue has 44 numbered A4 size pages. 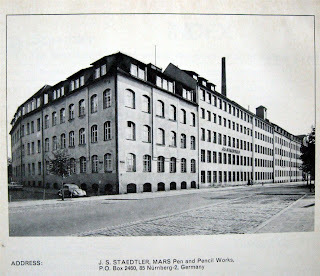 The pen and pencil works at Nurnberg. 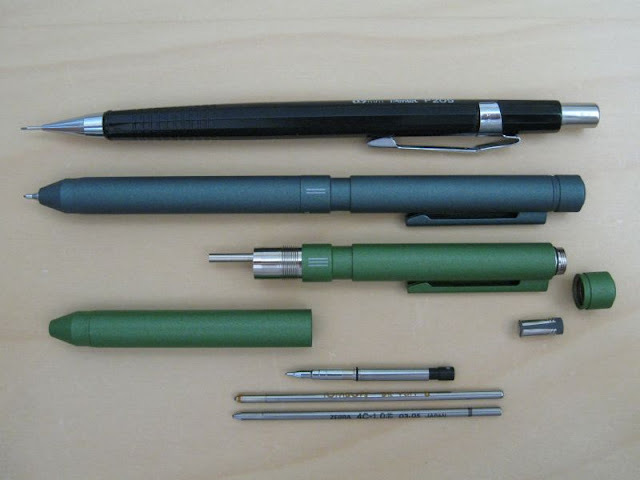 Here’s the mechanical pencil range. Four styles of 2mm clutch pencil / leadholder! That's their entire range. Just think about it for a moment. 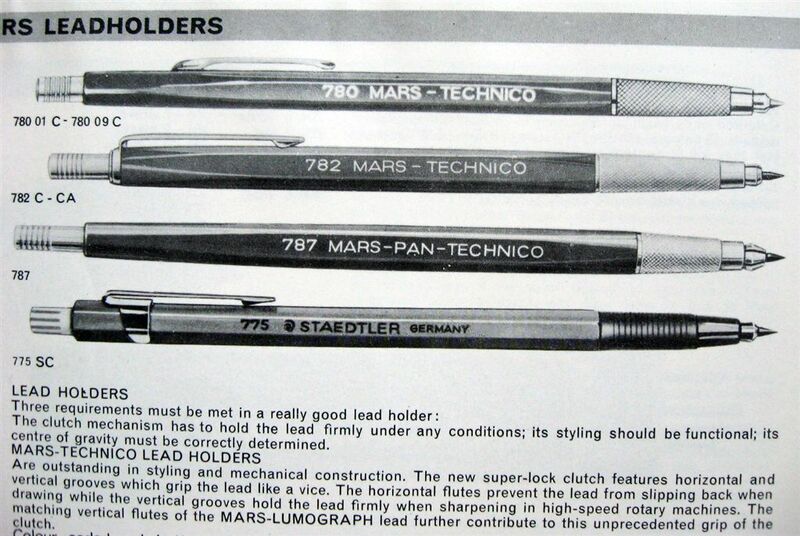 Astronauts were walking on the moon and Staedtler couldn’t make a 0.5mm or 0.7mm mechanical pencil? Was making 0.5mm lead more difficult than sending a man to the moon? Their entire mechanical pencil range was 4 leadholders. Take another moment to think...the guys who designed those space rockets...they drew the plans hardcopy with pen and pencil, calculated things with slide rules...no CAD for them! 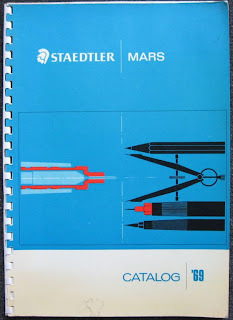 Now, to be fair, I believe Staedtler did release their first 0.5mm pencil in 1969, just not in time to get in this catalogue. Faber-Castell had been selling thin lead pencils for a couple of years, and Pentel for much of the 1960’s, but leadholders were still the mainstay of the drafting fraternity. I would like to thank Staedtler for giving me this catalogue and a little trip back in time. 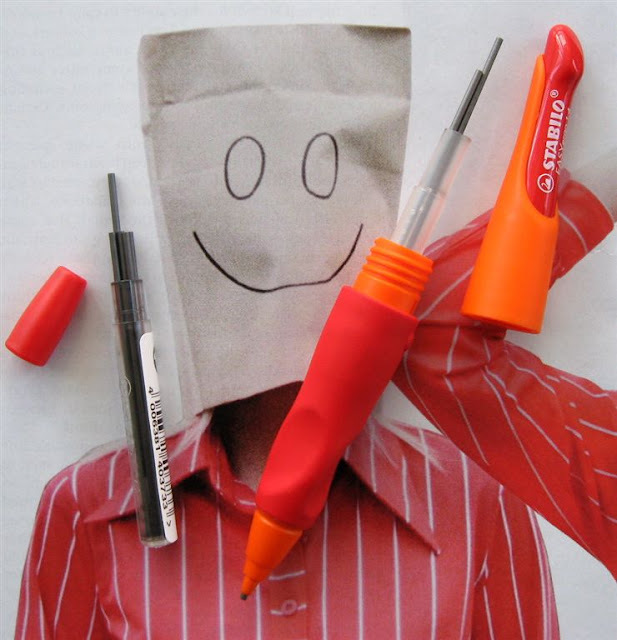 I just wrote to my local national Staedtler and asked, “Any spare catalogues hanging around, especially old ones?” They replied unfortunately they had just had a big clean up and thrown away a heap of old stuff. Arrrrrrrggghhhhhhhhhhh!!!!!! But they had this old one if I wanted it....? You may have noticed a slow down in publishing articles and approving comments over the last few weeks, well that’s because I’ve been away on holiday and the blog has been on auto-pilot for most of the time. All good things have to come to an end, and I’m back home now, so normal transmission should resume shortly. In the past I have taken suitable mechanical pencils away on holiday, but this time I decided to go old school, really old school - wooden pencil and penknife. Seeing I was traveling overseas to distant lands I thought a Viking 400 Skioldungen #2 would be a suitable choice, Swiss army knife for sharpening and an MD notebook to write in. More on the notebook in the future. Of course one cannot journey to foreign lands and not obtain a new mechanical pencil. Choices were limited in my touristy part of the world, so it was something like the best of a bad lot.